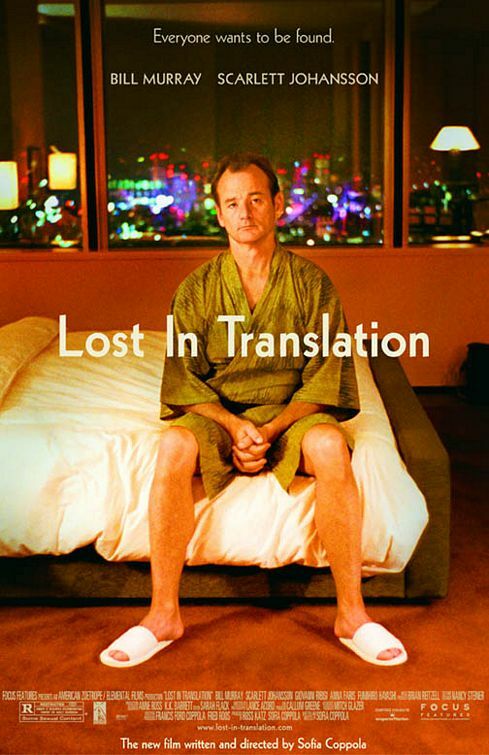 Written and directed by Sofia Coppola, Lost in Translation is about an encounter between a washed-up actor going through a mid-life crisis and a 20-something woman struggling to find fulfillment in her life and marriage. While I enjoyed this movie well enough, it’s certainly not for your average moviegoer. It is essentially a character study and not much more. Nothing really happens; lives are not radically changed. And yet, it’s those very things that make this film feel very real. One gets the feeling while watching that Lost in Translation would have been a complete and utter failure without the casting of Bill Murray as actor Bob Harris. His dry delivery and nuanced expression are key in a film with such little dialog. The subtle humor he manages to bring to an otherwise bleak film without overwhelming it is its saving grace. I would have enjoyed more interaction between Scarlett Johansson’s bordering-on-brooding Charlotte and Anna Faris’ bubbleheaded actress, Kelly. Throw Bob into the mix, and I think there was some missed potential there. Overall, I’m a little surprised this movie won the Best Original Screenplay Oscar. Then again, looking at the competition for 2003, nothing else jumps out at me as something that should have beat it. Either way, it’s a good study in how to put together a story about nothing more than two people struggling in life without making it boring. Favorite line: During a phone call between Bob and his wife, Lydia, that dissolves into a marital spat. Lydia: Do I need to worry about you, Bob?